Fuzzy, spray-painted borders line the concrete floor; large canvases and tribal masks hang from brick walls. A beautiful grey whippet lies on a sofa, inured to the smell of art in the making. I’m at the Footscray studio of Fred Fowler, an artist who could be described in several ways: a graduate of the University of Melbourne’s Victorian College of the Arts, a former street artist, a highly sought-after contemporary artist known for his colourful, semi-abstract, motif-laden landscapes and, most recently, a collaborator with the hugely popular fashion brand Gorman. 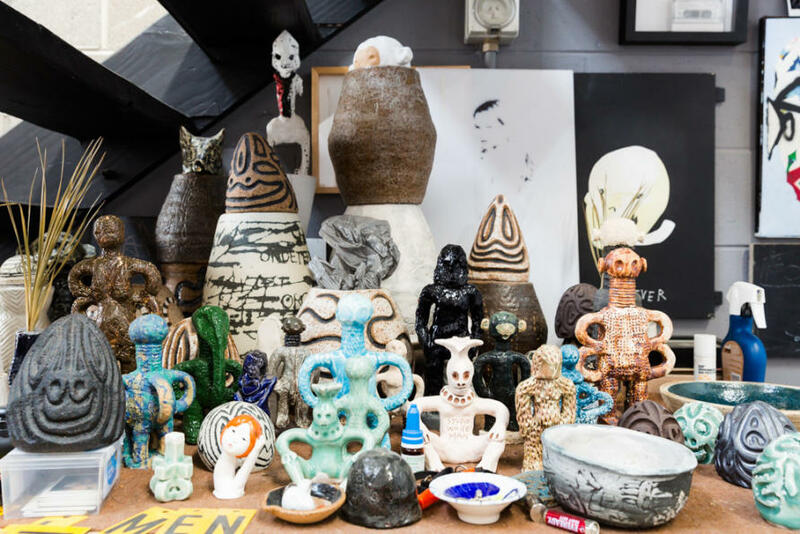 Pieces from Fowler’s Gorman line – a 43-piece Autumn/Winter collection that was launched in mid-April – hang in his studio alongside boxes of chalk, tins stuffed with paintbrushes, an electric guitar. They don’t look out of place. From the paintings on the wall, I can pick out different elements that feature in the playful patterns and bold silhouettes of the Gorman range. As a key part of each seasonal collection, Gorman features regular collaborations with Australian and international artists who provide exciting new patterns and designs. 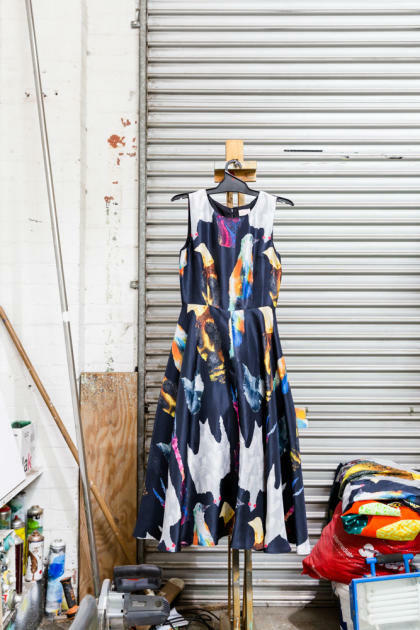 Local artists Rhys Lee and Miranda Skoczek, Brooklyn-based designer Kate Kosek and east London-based artist Camille Walala are among those who have previously joined forces with the label. As Fowler tells it, his own collaboration came about organically. Last year, he received an email from the label’s founder Lisa Gorman, asking him to work on a collection. “I’d seen their other collaborations and thought they really did the artwork justice and worked well so I was pretty keen,” he says, somewhat laconically. Gorman and her team of designers visited Fowler’s studio and photographed a bunch of animals and other elements from Fowler’s paintings, including Endangered and Extinction, which draws on Australian native and introduced species. They played around with the photographs and made them into repeatable patterns, trying to keep the colours accurate to the paintings. 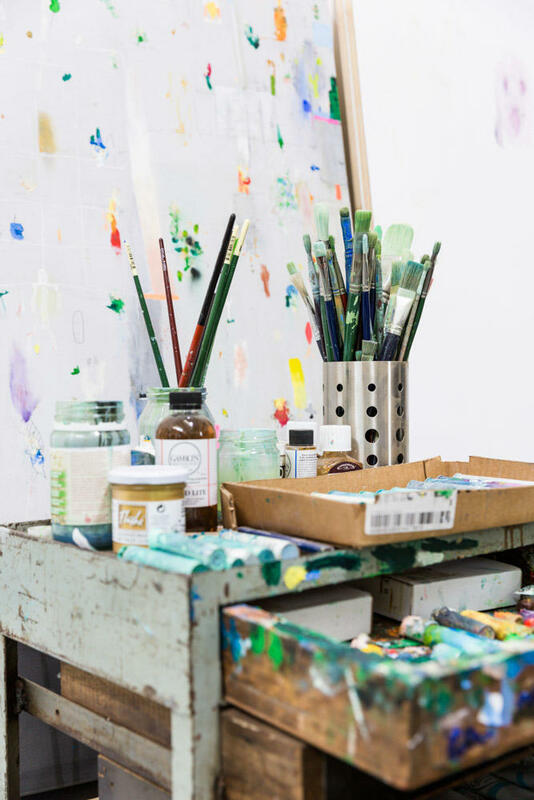 Inside the studio: Picture: Drew Echberg. Fowler says he also drew some fresh drawings of faces in ink, rather than spray paint, so they were “nice and clean” for the designers to embroider or screen print. He pulls out a boxy cotton quilted jacket covered in spooky mask-like faces from the collection, and lays it alongside the original sketches so we can see the transition. It wasn’t until last week, at the launch of the range in Melbourne Museum’s Forest Gallery, that he saw people actually wearing the Fred Fowler X Gorman range, which includes dresses, jackets, shirts, skirts, pants, umbrellas, bags and socks. Fowler has – to use the cliché – come a long way. In 1996, 15-year-old Fred Fowler was going out at night alone, spray painting his signature name tag “NUROCK” in large, complex pieces on the walls, trains, buses and trams of North Melbourne and the CBD. Graffiti by Fred Fowler aka NUROCK in North Melbourne, 1997. Fowler was 17 when he was arrested for trespassing and vandalism but, given his age, he doesn’t carry any convictions. That brush with the law, he says, was something of a catalyst in turning his energies towards art. Following his first solo exhibition, Raiders of the Lost Art, in 2001 at A.R.T. Gallery Eden in Melbourne, Fowler spent five years in a studio in the Nicholas Building on the corner of Melbourne’s Swanston Street and Flinders Lane experimenting with stencils, posters, rock carvings and painting. With his studio buddy Marc de Jong, he also had a DJ’ing gig at the fabled nightclub Revolver. 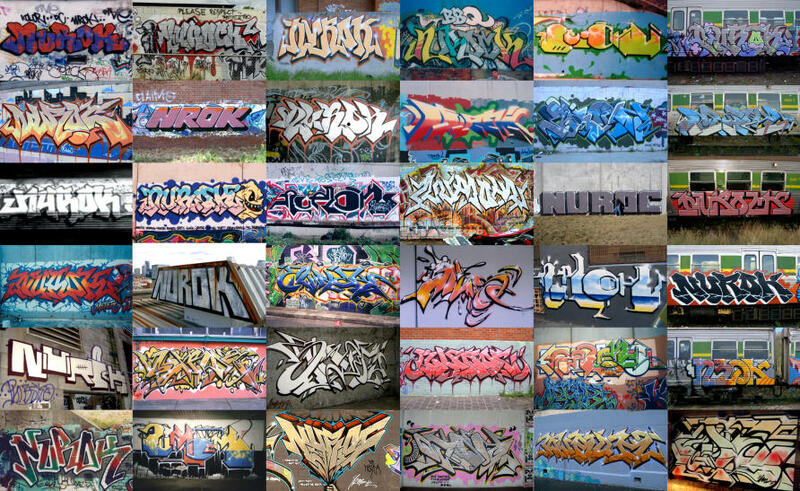 In 2005, ten of Fowler’s works were acquired by the National Gallery of Australia as part of a larger acquisition of early Australian street art. Fowler worked as a graphic designer before taking a break for a year in 2010 to live in Paris. He came back to Melbourne to study at the Victorian College of the Arts, where prominent Australian artists Jon Campbell and Jon Cattapan supervised his first and second year respectively. “They were encouraging and opened me up to new artists and new directions I could go in,” he says.“I learnt how to do bronze casting with Tim Edwards and wanted to take advantage of all the facilities to learn as much practical stuff as possible. 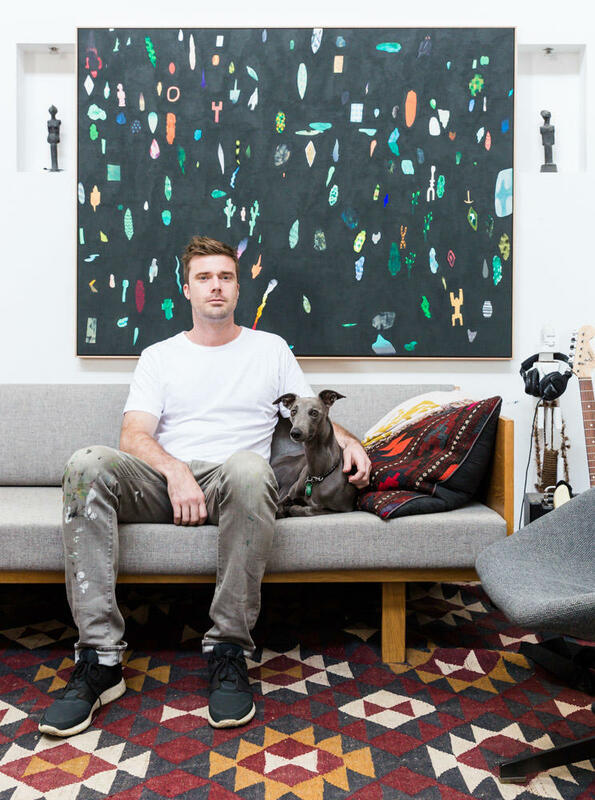 In his white T-shirt and paint-splattered grey jeans, Fowler looks at home in the studio he shares with his partner, film-maker Bridget O’Shea. We are meeting just a few days before the pair marry and head off to California for their honeymoon. In front of the roller door, among clusters of ceramic creatures, cans of spray paint and industrial tools, there are evidently many different creative projects in progress. On the desk beside Fowler’s laptop is a copy of Henry Reynolds’ 2007 book Forgotten Wars, about the battles fought between Indigenous inhabitants and white colonialists on Australian soil. “My paintings about native and invasive species are my way of using an analogy to talk about colonialisation,” he says. “I enjoy the challenge of making art that’s political but is also aesthetically pleasing, art that people find attractive and want to have in their houses. He moves rapidly from one influence and idea to another. “I want to start doing some trips around Australia to visit rock art sites and remote areas,” he says. “I want to get out into the landscape and do some more work there. As the Hubble Space Telescope prepares to mark its 30th year, what can we expect from its successor, the James Webb Space Telescope?